Limited Commemorative Wedding gifts with Harry and Meghan Available! 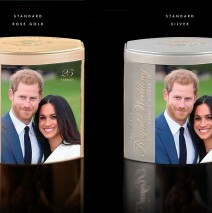 Posted by Marsha Goodale on 2018/05/07 in Articles, Slideshow, Upcoming Events | Comments Off on Limited Commemorative Wedding gifts with Harry and Meghan Available! Home » Articles » Limited Commemorative Wedding gifts with Harry and Meghan Available! Coming as soon as the baby does another Royal Mug! Another Royal Wedding has happened and what a wonderful spectacle to share with the world! We have a limited amount of commemorative items with Harry and Meghan available in limited release. Unfortunately, once they are gone they have already stopped making them. We can take payments over the phone for the items, and ship if necessary. We cannot hold items without a payment, so it would be prudent to come take a look while they are available. All inquiries may be made at 352-735-2551. We also have a wonderful assortment of fine bone British china which is great for gift giving!